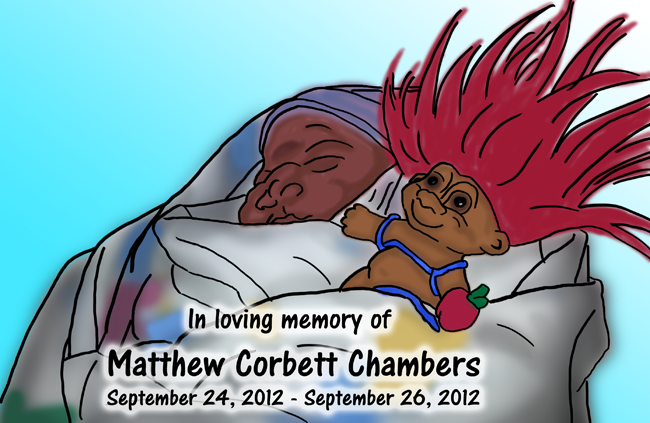 It is with a heavy heart that I report that my newborn nephew, Matthew Corbett has passed on. He put up a strong fight and we were fortunate to have him for a full 36 hours. In memory of Matthew, there will be no comic this week – Instead, I offer to you this rendition of a photo I took of Matthew holding my wife’s Troll Doll, Alligator Le’Troll. Although Matthew’s time with us was short, he was no less a blessing and a gift. He will be missed but not forgotten. In lieu of flowers, Matthew’s parents have requested that you consider donating to SOFT, a organization dedicated to Trisomy support and education. Thank you all for your continued prayers and kindness.